While Sharon, Janie and Mary went back to Cafe Du Monte for more beignets and coffee, I ran on the treadmill at the hotel with the Gainsleys. I covered 6.03 miles in hour and seven minutes. The plan for the day is a planation tour. 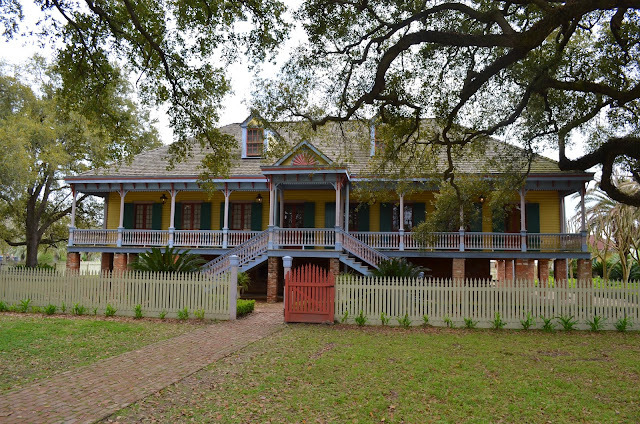 I researched tours a couple of months ago when we first decided we were going and settled on a tour that included the Laura Planation and the Oak Alley Plantation. 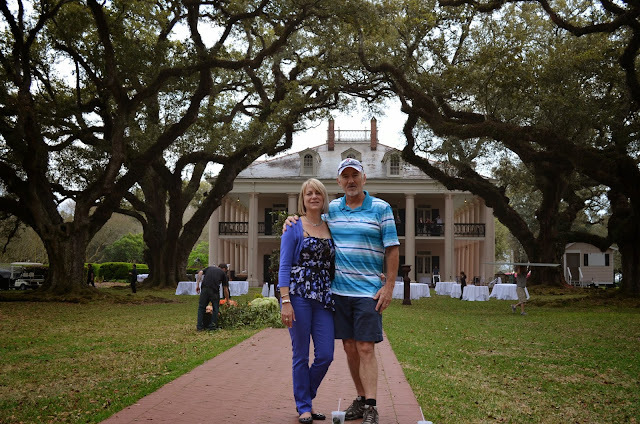 Sharon had seen the Oak Alley Plantation on a television show and really wanted to go there. Catching the van about 12:30 pm, we headed out of New Orleans and up the River Road along the Mississippi River. The first stop was the Laura Plantation. This stop included about a 70 minute tour of the house and grounds. The tour guide did a very nice job talking about the history of the plantation, its owners, slavery and sugar cane farming. Note to self, I really need to find a book on the Creole culture. The next stop was the Oak Alley Plantation. The tour at this plantation focused on more on the house rather than the plantation culture. I was surprised that they were selling mint juleps as we entered the house. The highlight of this stop is definitely the 28 three hundred year old oaks that line the entry to the house. By the the time we got back to the hotel, it was after 7 pm, Sharon made reservations for a late dinner for Arnaud's Restaurant. This was definitely the best meal of the trip. I had Oysters Arnaud, a sampler of one each of their baked oysters and Pompano Duarte. The menu is billed as Creole cuisine. Sharon brought the restaurant's cookbook. I suspect that the fall dinner party this year may feature Creole cuisine. As a general observation, we found the prices for meals very reasonable compared to other places that we have been. The group, Sharon, Janie, Mary, the Gainsleys and I, finished the night at the bar in the SoBou Restaurant in the W Hotel in the French Quarter.